Happy Monday! I hope your weekend was relaxing! I accomplished a lot this weekend. We updated our laundry room light, I cleaned the attic...Dr.J really appreciated that! I did a little clothes shopping for our Christmas photos...I started really late but that is the case every year. 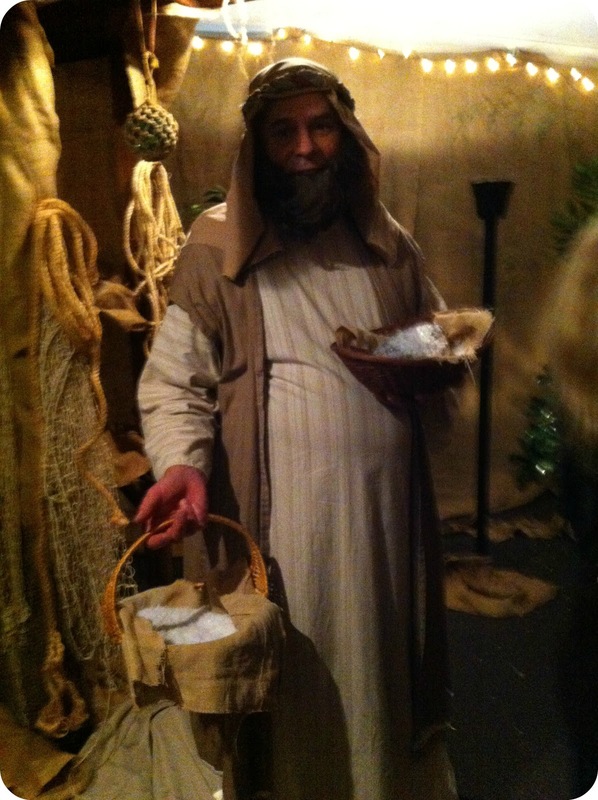 :) On Sunday night we took a walk thru Bethlehem! 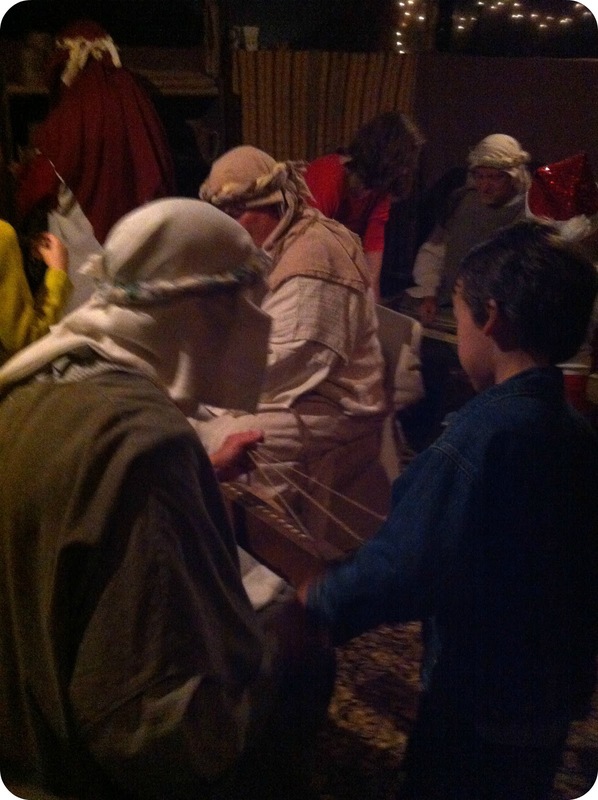 Since 1982 a church in our area has hosted the Walk thru Bethlehem. This was our first time attending and it was really awesome. The work they put into this is absolutely amazing. They had camels, sheep and donkeys. The entire area was covered in wood chips to represent the town area streets. 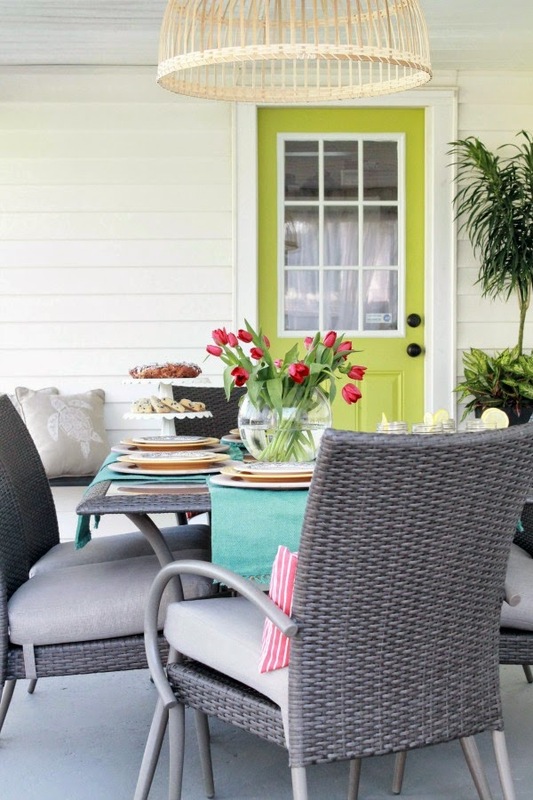 It was decorated to the extent that you felt as if you were there. Everyone was in costume and stayed in character the entire time. 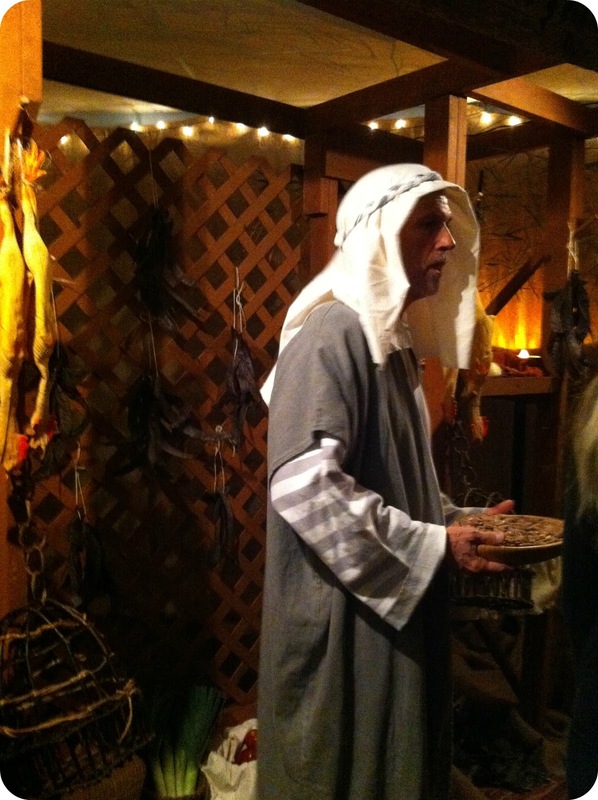 The Walk thru Bethlehem takes place during the census. 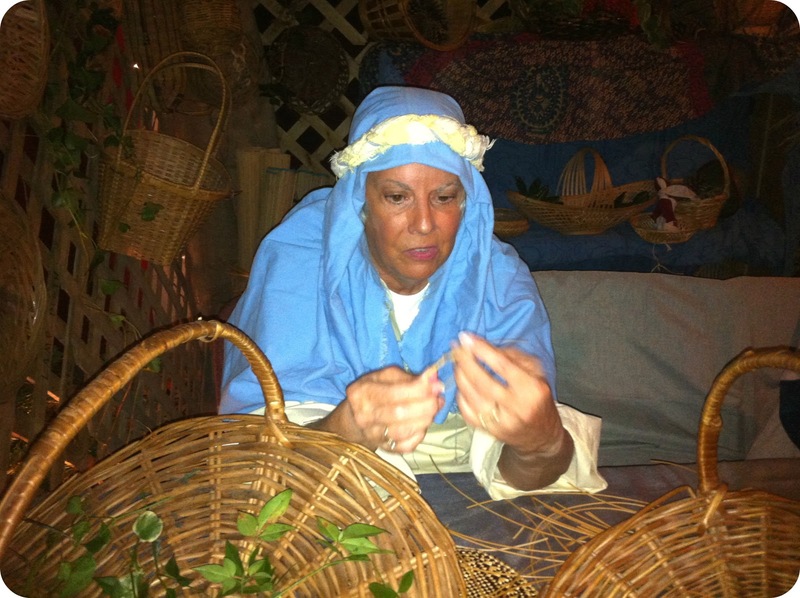 There are many shops to visit around the village so take a journey with me thru Bethlehem. The pictures were all taken by my daughter with the cell phone, sorry they are a little grainy, I left the camera at home. Fish Market - only clean, salted and dried fish are sold here. The kiddos got to salt the fish. At the food market, they sold foods and spices from local growers. The almonds were amazing! 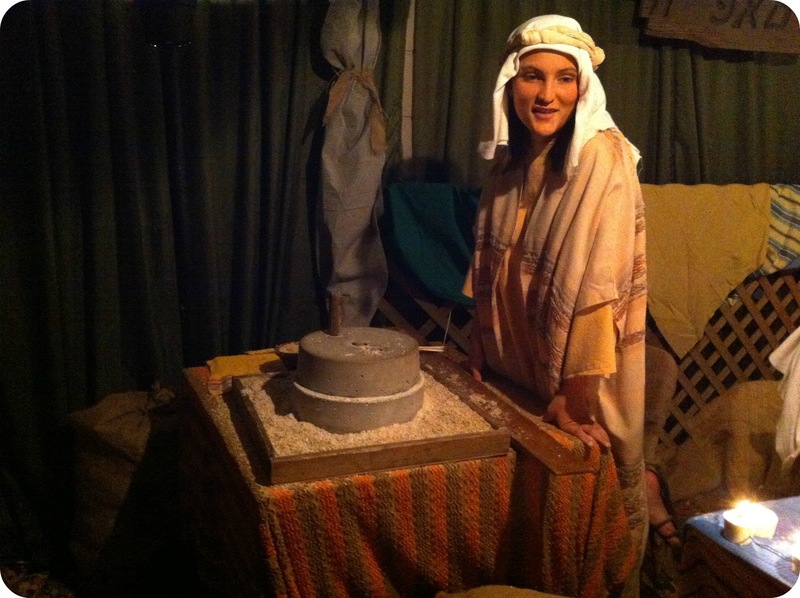 At the village oven, we learned how to grind grain into flour. You had to have a lot of upper body strength to operate that machine! We tasted matzo, unleavened bread. 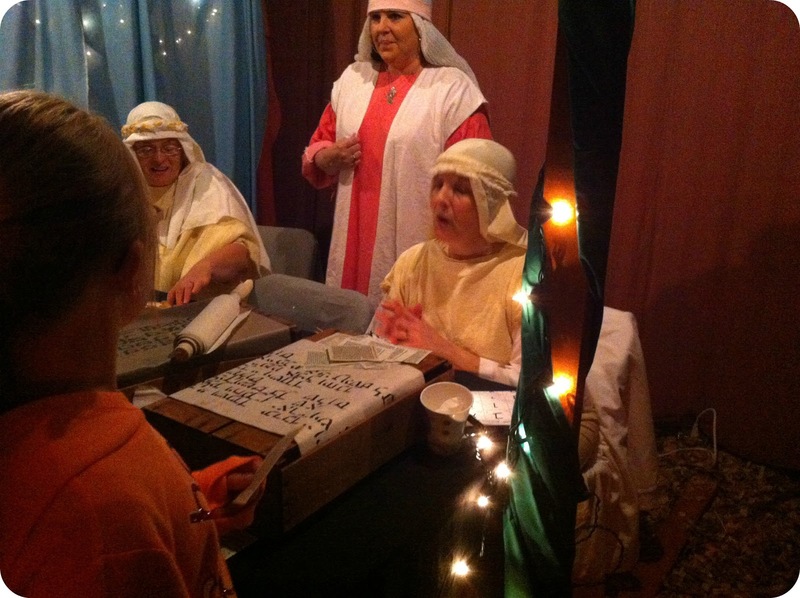 The Temple Hebrew scribes were busy at work copying the holy and sacred text. They wrote my sons name in Hebrew. 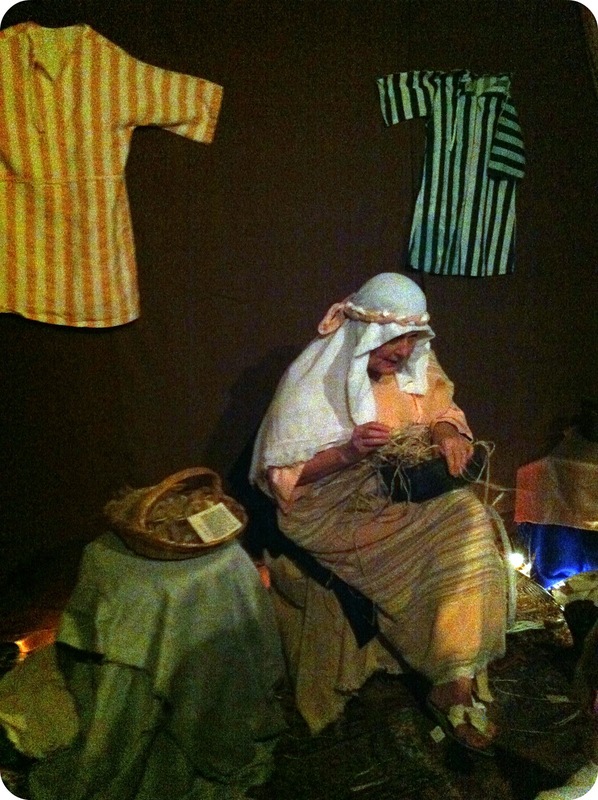 The tent maker showed us how to make rope. My son J made the rope not pictured, with three pieces of string hook up you had to spin the lever with just one hand, then take the string off and hit it across the apparatus and it popped together forming rope. Amazing I tell ya! The ladies at the basket weaving shop showed the kiddos how to make bracelets out of reeds. 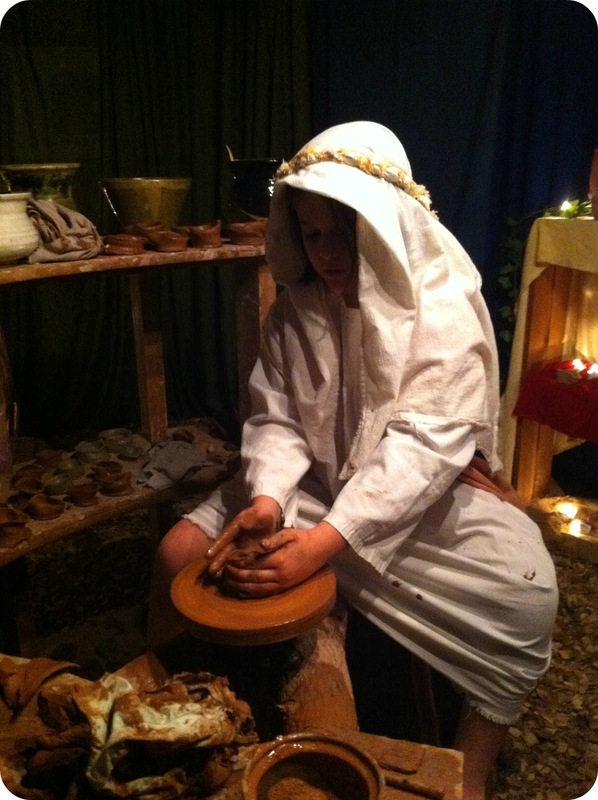 We saw pottery being made on the potters wheel at the pottery shop. We made oil lamps but mine turned out horrible. This was the best stop, at the storytellers! She had all the kids sit down and she told the story of the promised Messiah. As she was nearing the end a Shepard came in to tell that an angel had just visited him and a baby has been born in a nearby stable. We got to meet that little baby and his parents! Many forget why we celebrate Christmas and at times we even get lost in the hustle and bustle of the holiday. The birth of Christ is the reason we celebrate this season and it is important for me to pass this along to my children. They learned a lot last night and so did I, not just about Jesus but about the way of life and what took place around the time Jesus was born. We made rag dolls, sampled fresh goat cheese, saw fresh grapes pressed into juice, watched olives being pressed into oil, tasted juice from an apple and saw the physician! See ya soon! Next year we can go together, you would love it! I hope so, you would like. 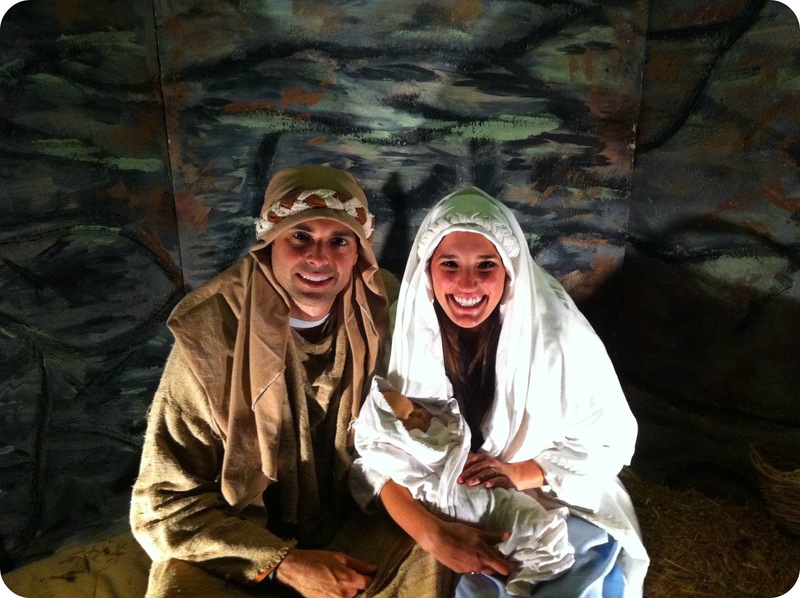 You have never seen any church production like this one!